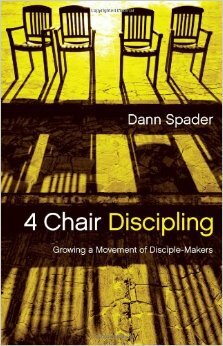 I am currently reading an excellent book by Dann Spader called 4 Chair Discipling. In this book, Spader takes a look at Jesus’ life and ministry and pulls out principles for us to strive for as we seek to make disciples. Each chair represents a stage in the growth process in the Christian life. Spader identifies how Jesus’ method of teaching and ministry can be applied in our groups and churches. He also explains the practical needs of people in each stage; seeker, new believer, worker, and disciple-maker. Here is a summary of each chair (adapted from appendix 3 in the book). Hopefully this can be helpful for you as you seek to follow Jesus’ heart to make disciples in your life and ministry. A great evaluation tool! The seeker who is spiritually dead who we need to reach out to and win for Christ. Left the comforts of heaven and entered our world. He prepared himself for thirty years, learning the context and culture in which he was sent. He made himself available and intentionally developed relationships. He responded to those who showed interest. Relationships with Christians who are willing to be in their world. Need to get their answers, concerns, and objections addressed. Need Christians who make themselves available. Someone to present the gospel clearly to them. Come and see challenge is simple and we can do it, make friendships. Jesus Christ is the only means by which a person can be saved into a personal relationship with God. Evangelism is most effective when we are motivated by love. Evangelism is a byproduct of a healthy body. Evangelism is best achieved through relationships. The new believer who is young in the faith and needs to be built up in the faith. Learn to walk on own. Develop a relationship with God. Without immediate nurture, new Christians wills struggle and, in many cases, won’t survive. Must not forget the importance of identity in Christ. Spiritual children need a family, the church. The worker in God’s kingdom who needs to be equipped to serve. We look for those who are AFTER more! Available, Faithful, Teachable, Enthusiastic, Responsive to leadership. Transition in leadership—from John Baptist. Transitions of message—repent and kingdom is near. Transition of calling—to be in Jesus’ ministry team being taught to reproduce—one that would involve servanthood, sacrifice, and suffering. To see and experience God use them. How to rely in the Spirit for strength to do ministry. Learn new skills for ministry, be equipped (Eph. 4:12)—repair and prepare. Many believers do not make it through chair 3. Takes a conscious choice to persevere! It takes time to mature to parenthood. The disciple-maker who is making disciples who needs to be helped to multiply life and ministry. Jesus took three and a half years to invest in a few and build a movement of multiplying disciples. Jesus had taken his disciples from seekers (John 1:39) to followers (John 10:27) to coworkers (Matthew 4:19) and then finally to disciple-makers (Luke 10:2). Help in succeeding in the unique ministry God had put on their heart. Takes defining mission, clarifying values, establishing faith, building goals and plans. They may look like the enemy. Can look like competition because they are often out launching new ministries and recruiting new people. May look very different than one another. Can be messy. Can be a wide range of possibilities. July 17, 2014 in Discipleship, Ministry.